Next week, I will attend the Reading Club Salon 2014, the 3rd annual round table discussion sponsored by the Lion Rock Institute (LRI), Hong Kong's free market think tank. The theme of this year's discussion will be "New Class, New Inequality?" The theme of the EFN Asia Conference 2014, to be held also next week in the same hotel will be on Liberalism and Inequality. So the LRI event provides additional theoretical discussions to the EFN conference. Session II: Inequality: Rooted in Economics? Session III: Attempts for an Equal Society: Creation of a New Inequality? 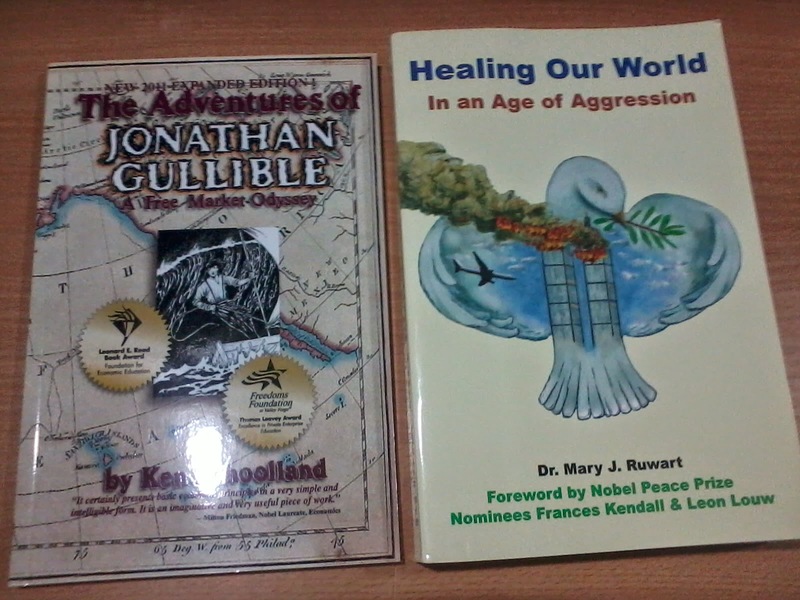 And here are the two other books, hard copy.. I first met Ken and Mary in 2007 in Hawaii, during the first Pacific Rim Policy Exchange sponsored by the Americans for Tax Reforms (ATR), International Policy Network (IPN, London), Property Rights Alliance (PRA), LRI and the Grassroot Institute Hawaii (GIH). The greatest illusioп vas tћat industrialization апd collectivizatioп iп the U.S.S.R., апd destructioп of capitalist ownership, would result in а classless society. Iп 1936, vheп tће new Coпstitutioп was promulgated, Stalin aпnouпced tћat the "exploiting class" ћаd ceased to exist. The capitalist and other classes of ancient origiп had iп fact been destroyed, but а new class, previously unkпovn t.o history, had been formed. It is understandaЬle that this class, like those before it, should believe that the estaЬlishment of its pover vould result in happiness and freedom for all men…. 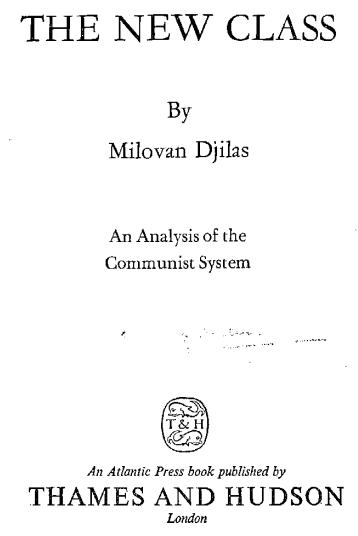 This new class, the bureaucracy, or more accuтately the polltical bureaucracy, has all the characteristics of earlier ones as well as some пеw characteristics of its оwп. Its origiп had its special characteristics also, even tlюugh in essence it was similar to the begiпnings of other classes. This is a straightforward discussion of the ugly nature of the bureaucratic class. Neither capitalists nor workers. Just plain regulators, tax/revenue collectors and spenders. They are the class that immediately becomes the ruling power after a successful socialist revolution, like what happened in Soviet Russia. A "classless" society is impossible even in theory because government will always create a group of men and women, elected or appointed, who will command and control the rest of the population what are allowed and not allowed, what kind of penalties and fines to impose on violators, create new regulations and prohibitions in order to address and correct past government failures. In loose terrпs, as the new class becomes stronger and attains а more perceptible physiognomy, the role of the party diminishes. The core апd tће basis of the new class is created in the party and at its top, as well as in tће state political organs. The once live, corпpact party, full of initiative, is disappearing to Ьесоrпе transformed into the traditional oligarchy of the new class, irresistibly drawiпg into its ranks those who aspire to join tће nеw class and repressing those wћо ћаvе any ideals. Тће party makes the class, but tће class grows as а result and uses the party as а basis. Тће class grows stronger, wћile the party grows weaker; this is the inescapable fate of every Communist раrtу in power. As the state grows, the ambitions and desire for power of those who administer the state, the top Party officials and their lieutenants in the various bureaucracies also grow. I am not convinced though that the Communist Party becomes weaker as this political class becomes stronger. The Party is the chief machinery, the provider of institutional legality for the various polcies, programs and regulations of the state in ruling over ordinary mortals. Friends and family members, thank you very much for your greetings. Really appreciate them. This week, I received 400+ greetings, mostly in facebook (wall posts + private mails), by SMS, and a few by email. Among the funny greetings are these. 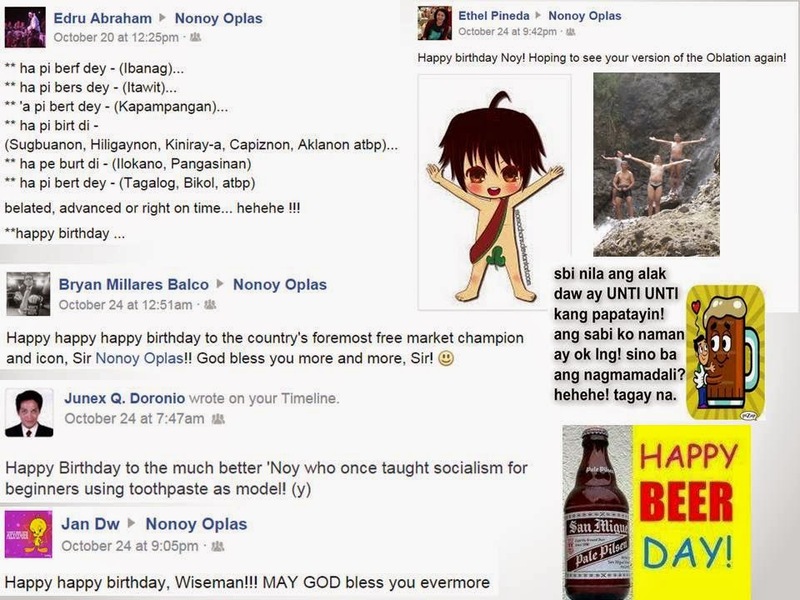 The beer greetings are from my mountaineering buddy Raymond Asanza. 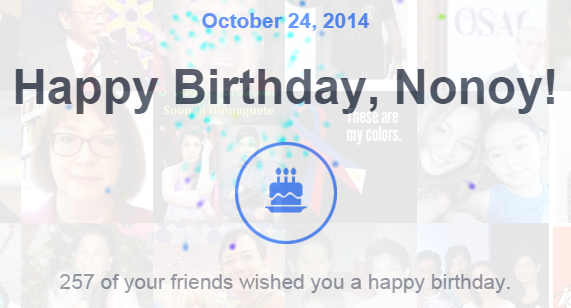 On my birthday, 257 friends greeted me in my fb wall. That's for 24 hours of that day. It excludes private mails. Then there are belated greetings until today, and possibly until tomorrow. 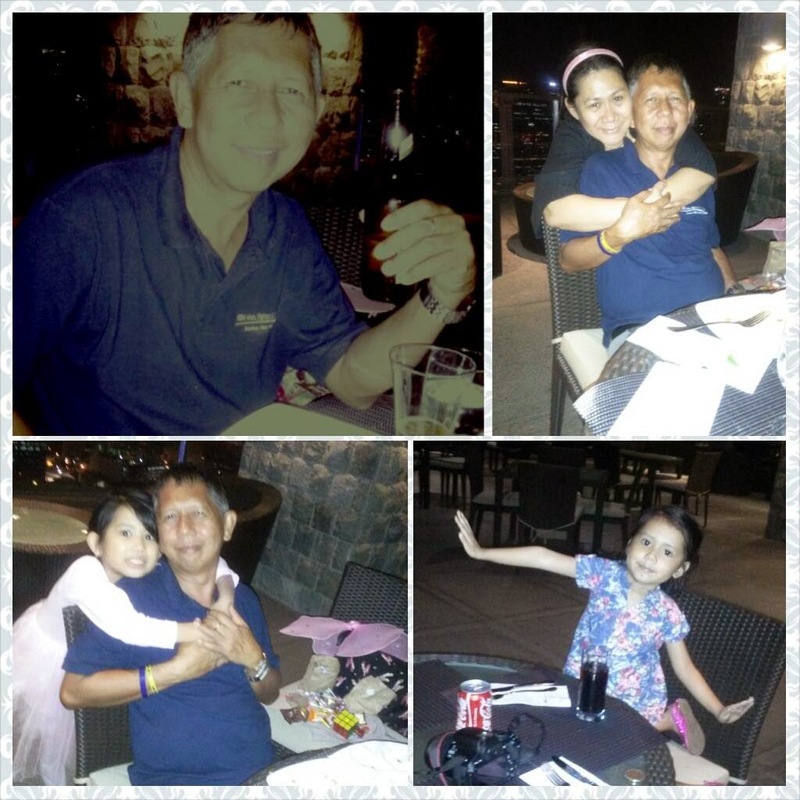 My wife treated me and the two girls to a birthday dinner on a nice resto-bar at one of Makati's new hotels. 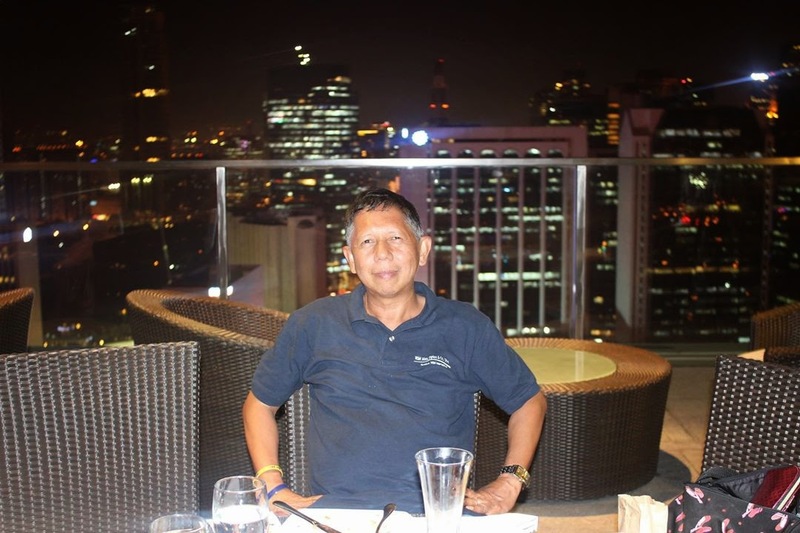 Nice view at the 32nd floor of City Gardens Hotel at Makati Avenue. We didn't eat much as the two girls came from an early Halloween and trick or treat parties and ate there. It was our first visit to this place. Again, thank you all friends for your greetings. Before, my favorite greetings to some friends on their birthday is this: May a million fleas infest the armpit and pubic hair of people who will annoy you today and the rest of the week. It generally makes them smile or laugh. Below are some funny quotes on birthday. "I'm a little bit older, a little bit wiser, a little bit rounder, but still none the wiser" -- Robert Paul. "Wisdom doesn't automatically come with old age. Nothing does, except wrinkles. It's true that some wines improve with age, but only if the grapes were good in the first place" -- Abigail Van Buren. "Here is the test to find whether your mission on earth is finished. If you're alive, it isn't" -- Richard Bach. China is initiating the formation of ASIAN INFRASTRUCTURE INVESTMENT BANK (AIIB) to cater to roads, railways, power plants, telecoms in Asia. 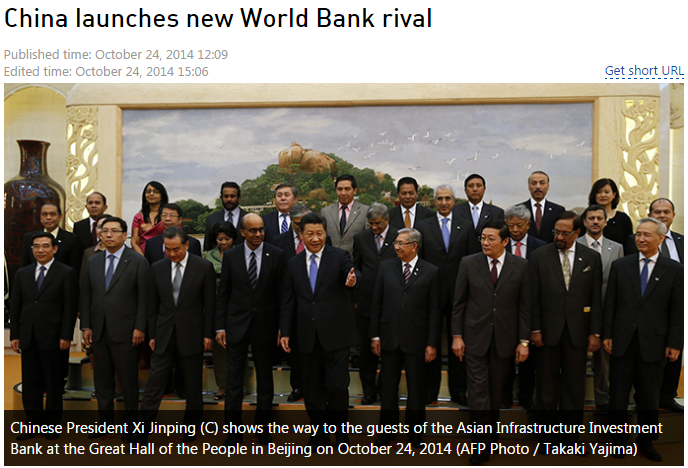 We don't love China but this competition to WB, ADB, IMF gives us better prospects, I believe. AIIB will prioritize hiring Chinese professionals, of course, but still it's able to increase demand effectively. I thanked Aiken for such heads up. I googled AIIB and here are some interesting news. Japan, Australia, South Korea and Indonesia were not represented at the signing ceremony for the bank, the Asian Infrastructure Investment Bank, in Beijing. India joined the bank, along with Malaysia, Thailand, Vietnam and the Philippines,..."
The memorandum of understanding signed on Friday said authorised capital of the bank would be $100 billion and that the AIIB would be formally established by the end of 2015 with its headquarters in Beijing, state news agency Xinhua said…. Conceptualized in October 2013, signed in October 2014, only one year preparation and the AIIB became a reality? Wow. And it will be formally established by end-2015, same date as the materialization of the ASEAN Economic Community (AEC). (1) The doves in the China Communist Party (CCP) are grappling, if not winning over the hawks. Befriending Asian governments, not alienating or fighting them. (2) Instead of RCEP, China is using AIIB in countering US initiatives at US-Asia trade integration via the Trans Pacific Partnership (TPP). 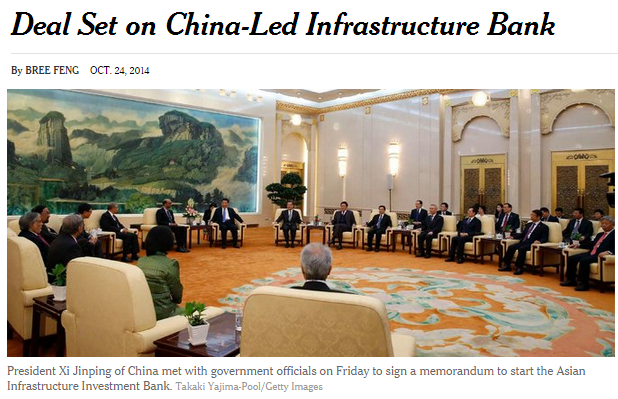 AIIB can be a back-door or side-door China-other Asians trade integration. I am not a fan of the CCP and the corruption and dictatorship that they practice, but I think this is a better development. More trade, commerce, loans, not more jet fighters, battle ships, submarines. Let business, trade, money and foreign diplomacy do the talking, never the jet fighters and the Generals. Aiken think this AIIB is scary because it will deepen the politics behind loans, TAs, aids. China will be able to gather more allies through AIIB. I don't think it is scary because it is just an extension of the politics of foreign aid All foreign aid bodies (WB, ADB, IMF, etc.) are politics driven, no exception. That is why the WB is always headed by an American, IMF is always headed by a European, ADB is always headed by a Japanese. So this AIIB will always be headed by a Chinese. Foreign aid by nature is government to government, so politics is 100 percent part of the equation. 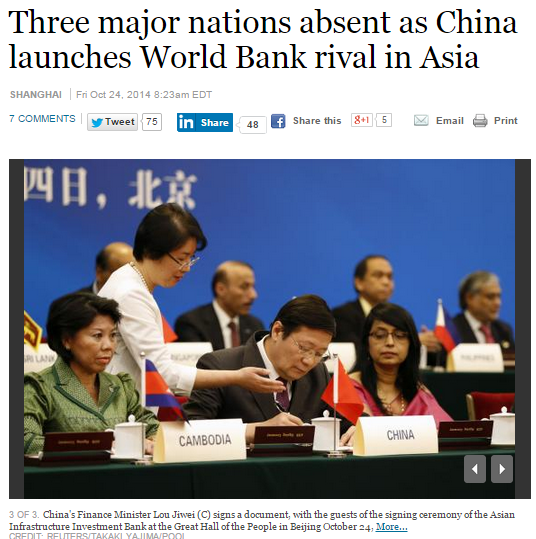 Thus, the AIIB can be the big Asian-government-bribery department of Beijing. All loans will have strings of course, like using Chinese consultants, engineers, suppliers, etc. I think it is part of the internal debate or conflict within the CCP. The dovish say, "Let us be rich via trade, commerce and AIIB" while the hawkish say, "Let us be rich via territorial occupation, get those natural gas and petroleum deposits in offshore East Asia." Both camps are corrupt of course, but still, we will have distance from the China war mongerers, including PH war freaks here who want Filipino taxpayers to send them billions of $ for the jet fighters, battle ships, submarines that they are pushing to the PH government. I dislike BIG government, communist or democratic. But between corruption and bribery via foreign aid (whether WB or ADB or AIIB loans) and corruption and large scale defense spending via militarization and territorial grabbing/defense, the former is preferable. Choosing a lesser evil. When I was working at the House of Representatives (HOR) from 1991 to 1999, I would attend many Committee hearings. Among those that I followed in the early 90s was the implementation of various large-scale government (DENR, LGUs, etc.) reforestation programs in the country, funding and loans coming from the ADB, OECF (Japan government), World Bank and other foreign aid bodies. The impression I got then was that there was huge money involved, there were lots of reforestation projects with little or even zero monitoring if the seedlings indeed became trees, or the planting was only for photo-ops, submit reports and get the money. Year in and year out, decades upon decades, the cycle is repeated. Most or majority of DENR-implemented reforestation projects are wasteful. 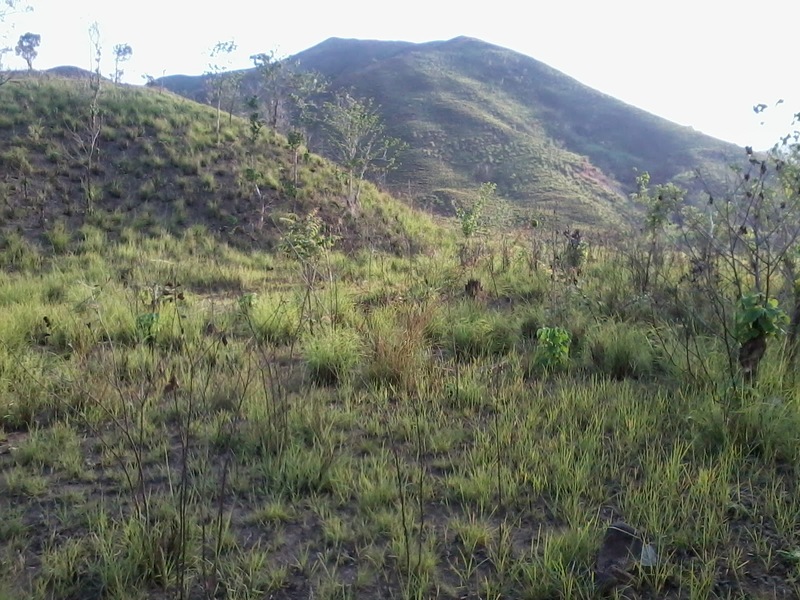 One example is the annual reforestation of degraded uplands adjacent to our farm in Bugallon, Pangasinan. Every year, no exception, there are tree planting there, for many years and decades since the 80s or even the 70s. And every year, the scene is the same -- degraded upland with more cogon and other tall grasses than trees. Most of the trees that survive are naturally-growing species and not planted. Below are the "left-over" seedlings that may no longer be planted in the uplands. The DENR and its contracted cooperative or planters deposited these seedlings in our farm, to be transported and planted in the uplands. I took these photos last Friday, October 18, 2014. It is no longer advisable to do tree planting at this time of the year because the rainy season will end soon. 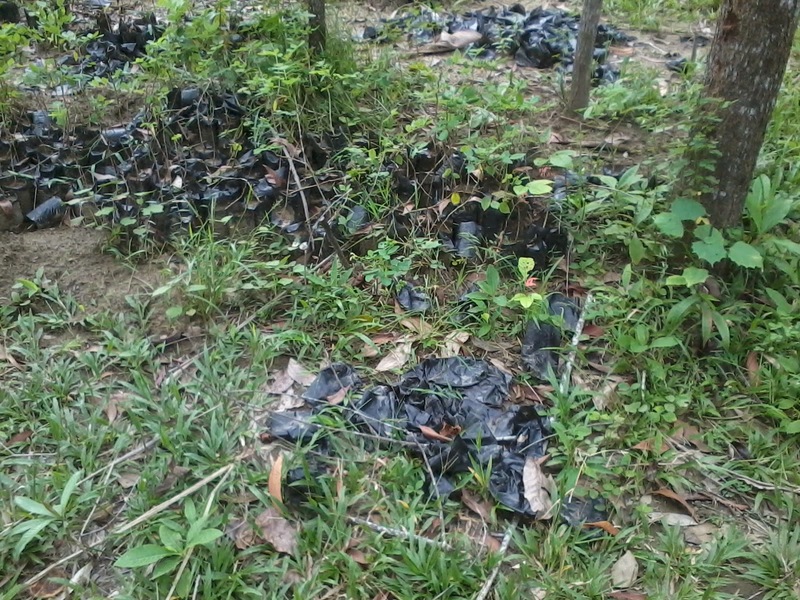 The contracted workers who should carry these potted seedlings up to the hills and mountain simply pulled the black plastic along with the soil in it. They only carried the uprooted seedlings, so they will be lighter to carry. This practice immediately injures the roots of the seedlings and would endanger their survival in the harsh environment in the uplands. 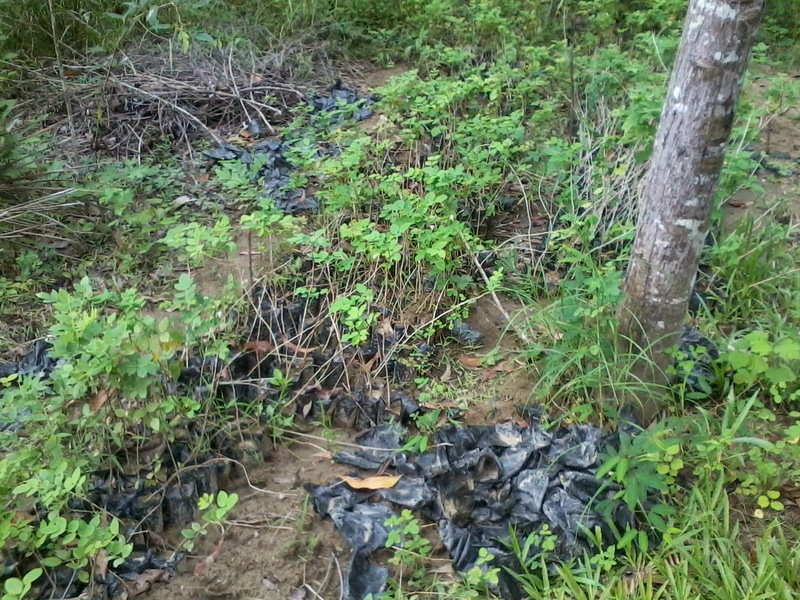 The uprooted seedlings were either planted, or they may have been thrown away, no one knows except the contracted and paid workers. 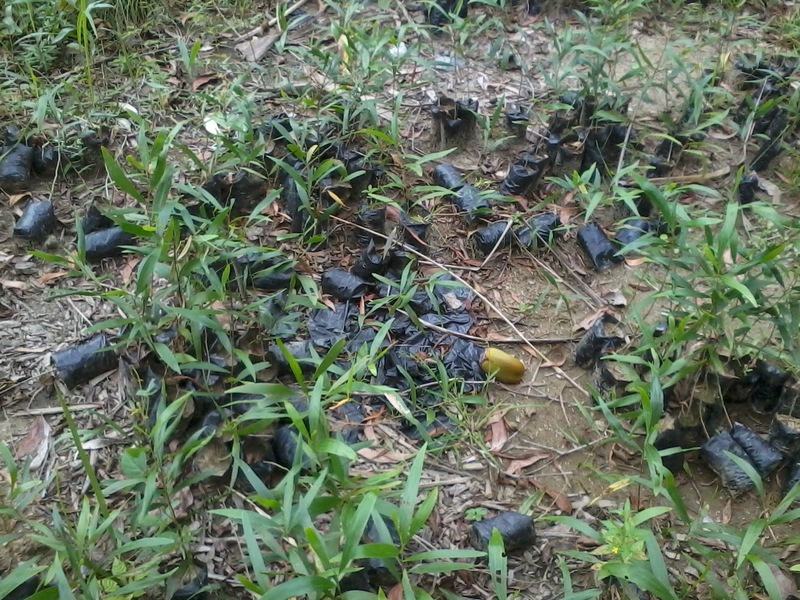 These were mostly acacia auri and kakawate or madre de cacao. 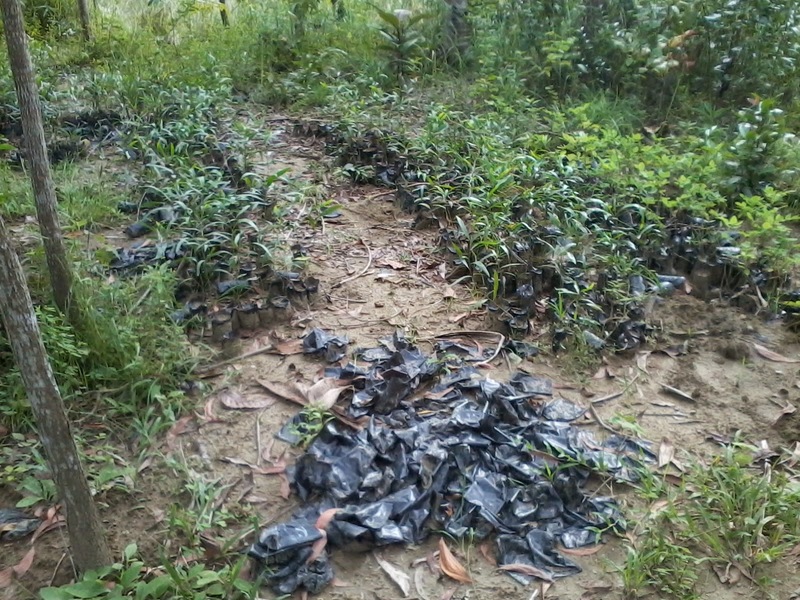 There are several hundreds, possibly a few thousands, of unplanted seedlings there. They will never be planted and even if these will be planted in the uplands, their chance of survival will be very low. The best months to plant would be in June-July as there are plenty of rains, allowing the seedlings to establish stronger roots and body. Assuming of course that the crawling and choking vines and tall grasses around them are cleared regularly. I do not know how much money was spent by the DENR, or by some foreign aid agencies that give grants or lend money to the PH government to be implemented by the DENR and LGUs, for this project alone. 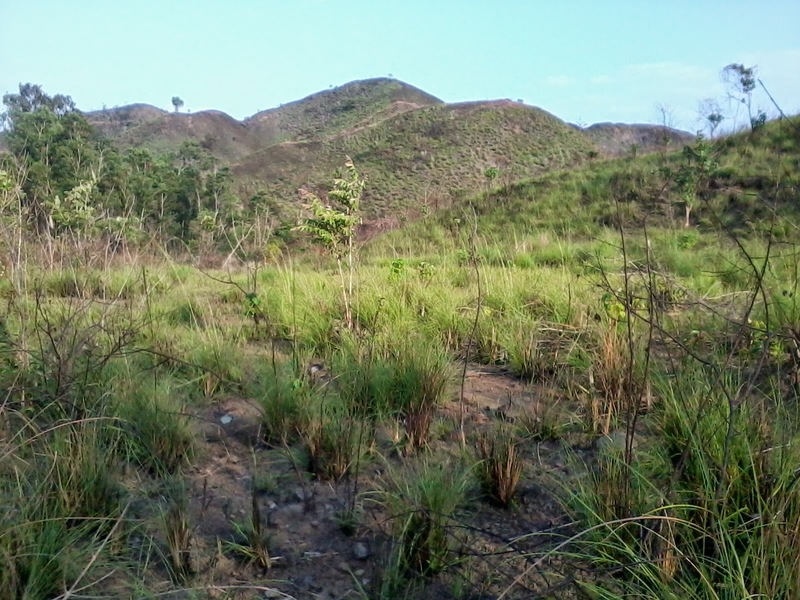 Despite annual government reforestations and tree planting programs (DENR, LGUs, other agencies) in the uplands of this part of the country for decades, the uplands and public "forest land" remain degraded. Photo below I took April this year, just adjacent to our farm. Top tree killers in the uplands are (a) choking vines, (b) grass fires occurring almost yearly, and (c) people who steal and cut the trees for charcoal, firewood, lumber and other uses. Below, another part of the "public forest land". Lots of spending and government borrowings, yes. Lots of new forest, no. Really inefficient and wasteful way to spend taxpayers' money. Germany's renewable energy is causing lots of instability in their national grid. See this story from NTZ, 24 September 2014, EIKE: German Power Grid More Vulnerable Than Ever…”On The Brink Of Widespread Blackouts”! 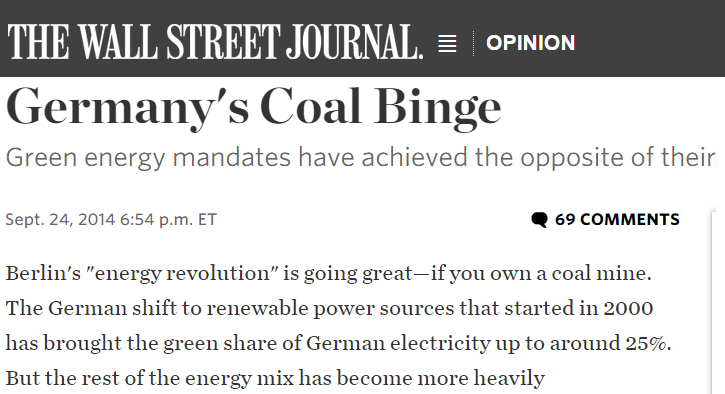 "Berlin's "energy revolution" is going great—if you own a coal mine. The German shift to renewable power sources that started in 2000 has brought the green share of German electricity up to around 25%. But the rest of the energy mix has become more heavily concentrated on coal, which now accounts for some 45% of power generation and growing. Embarrassingly for such an eco-conscious country, Germany is on track to miss its carbon emissions reduction goal by 2020. Greens profess horror at this result, but no one who knows anything about economics will be surprised. It's the result of Chancellor Angela Merkel's Energiewende, or energy revolution, a drive to thwart market forces and especially price signals, that might otherwise allocate energy resources. Now the market is striking back. slack whenever renewables don't deliver as promised." In one facebook group about energy, I continue to debate some anti--coal, anti-fossil fuel energy activists. One lady, Ms JL commented that "with coal energy you get all kinds of problems from coal mining to hauling to preparation of coal fired power plant to energy generation to post combustion wastes..."
If we were to try to increase wind and solar by a factor of 10 (so that they together amount to 12% of world energy supply, instead of 1.2%) we would need huge amounts of rare earth minerals and other polluting minerals, such as gallium arsenide, copper-indium-gallium-diselenide, and cadmium-telluride, used in making thin-film photovoltaics..."
Have the subsidize-wind-solar crusaders considered how many million tons of metallic and non-metallic minerals have to be mined on the ground to produce steel and cement to erect wind towers alone? Those towers are not made of wood or bamboo. Plus mining of rare earth materials to produce solar PV and wind turbines, plus more metallic materials to produce the bearings in wind plants, batteries for solar. 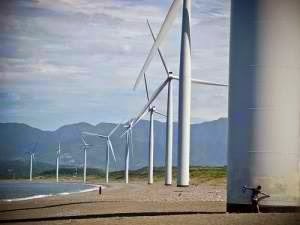 Notice also that in wind farms like in Bangui, Ilocos Norte as shown in this photo, there are no houses, no fishing village, no resorts, no other economic activities. They look cute for photography then posting in social media, but what about other people's livelihood? Such other livelihood and human settlements have to be sacrificed because those wind towers can collapse, or the wind turbines can burn, or the wind blades can fall down. There are many instances abroad that any of these have happened. See how big each tower is. The person's body in the photo looks like 1/20th the diameter of the tower base. Consider also how huge, how deep and wide the base, that part of the tower deep under the sand and not visible. I am not an engineer so I would't know how many trucks or tons of cement and steel are needed just to build one tower. And this youtube clip is one example why when there are windmills, there should be no houses, no resorts, no schools, no other human structures near them. Some don't even have farms beside these giant structures. This is in the US. "There should also be no houses no resorts, no schools no other human structures near the coal mining and the coal fired power plants?". Her fear is imaginary. If one will visit places near Sual plant in Pangasinan, Masinloc plant in Zambales, Quezon plant in Mauban, Quezon, Calaca plant in Batangas, etc., one will not see black smoke as often shown by the anti-coal activists. The decision to put windmills in areas where there are no houses, no fishing village, no resorts, etc. 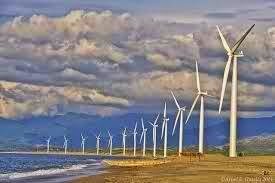 is made by the wind power developers themselves, not by the government (DOE or LGUs) or the environmental activists. 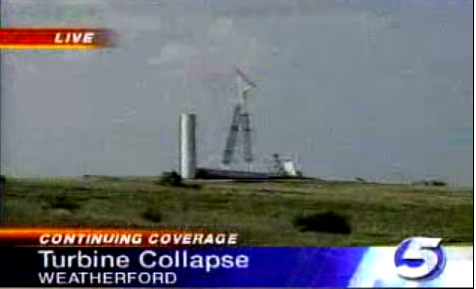 The wind developers know the real danger of those windmills collapsing. It is also possible that they relocated original poor seaside villagers so that those huge wind towers can be constructed. Poor or middle class communities and LGUs cannot afford to have those commercial and huge windmills. Most likely they cannot even afford to have a good, well-cemented roads, how can they afford those expensive towers? 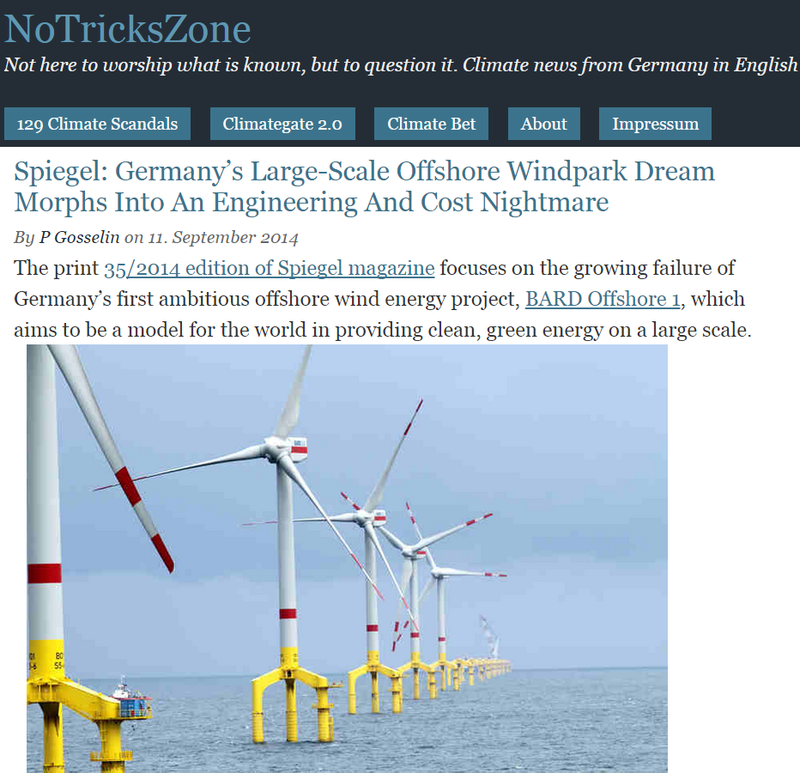 In Germany, to avoid such danger of collapsing wind towers to people and their houses or farms, they built huge, monster wind farms offshore, supposedly to generate 5MW each tower. As this story from NTZ will show, the result will make the subsidize-wind supporters cry. So if one is so concerned about any environmental damage of coal mining, then steel and cement mining to build many wind towers should also concern them. 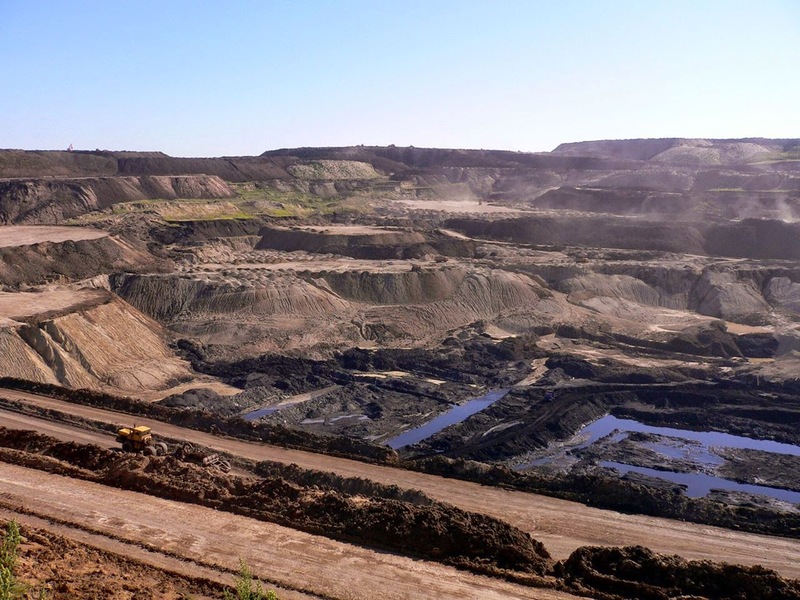 Some anti-coal activists post this “ugly photo” of coal mining. The discussion and debate should focus on power plants, coal and wind in particular, and not mining. But some activists keep raising the "ugliness" of coal mining, fine. Then mining of iron, etc. to produce steel, mining of lime, etc.to produce cement, should concern them too. No wind tower can be built without cement and steel. If people have to demonize mining of one metallic or non-metallic product, coal in this case because of its environmental damage, then they must demonize mining of other products that cause environmental damage as well. 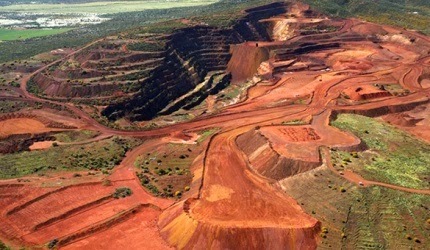 This is iron mining. Do the subsidize-wind promoters demonize iron mining, lime and cement mining that help build wind towers? Double talk is ugly and hypocrisy. Two weeks from now, I will participate in a small group meeting-seminar on intellectual property rights (IPR) of independent Asian think tanks to be held in Hong Kong. The event is sponsored by The Policy Workshop, a public affairs firm that helps clients meet public policy challenges and communications, headed by a friend, Cathy Windels. The event will be held one day before the Economic Freedom Network (EFN) Asia 2014 conference, Among the cool reading materials are these. The Global IP Center (GIPC) of the US Chamber of Commerce published a few months ago The International Intellectual Property Index, 2014 Report. Only 25 countries were covered though, the Philippines not one of them. Perhaps in the coming years. 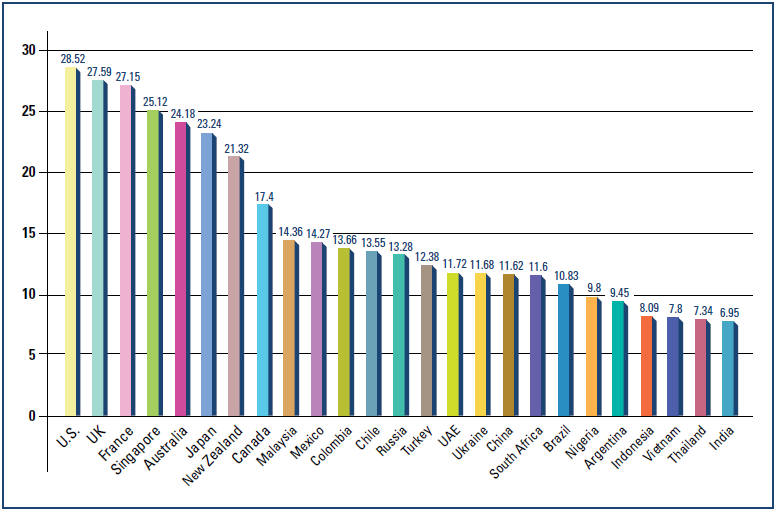 Here is the overall result, global ranking of the countries included. The GIPC Index consists of 30 indicators divided into six major categories. Each indicator is scored between 0 and 1. The maximum available score for the entire index is 30. 30. At least one free trade agreement with substantive and/or specific IP provisions such as chapters on IP and separate provisions on IP rights provided it was signed after World Trade Organization/ TRIPS membership. The criteria seemed to be "tailored" so that the US would be in #1 rank, a comment from a friend. Maybe but it was not the US government that made that report, it was the US Chamber of Commerce. In Asia, only China, Indonesia, India, Japan, Malaysia, Singapore, Thailand and Vietnam were included, and four of them are in the bottom -- Indonesia, Vietnam, Thailand and India. Here is another data from the World IP Organization (WIPO), shared by WEF in their fb page. 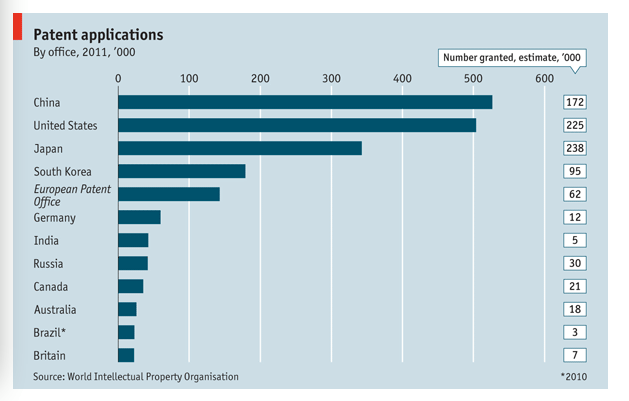 In terms of patent applications, a number of big Asian countries are on the top, they realize the value of IPR protection and its contribution to a more innovative, higher productivity economy. This data seems to contradict the GIPC Report although the latter covers all aspects of IPR while the WIPO data covers only patents. China soon surpassed the US in other important measures. Each year, Chinese universities award more PhDs in science and engineering than US institutions do – and more than twice as many undergraduate degrees in these fields. 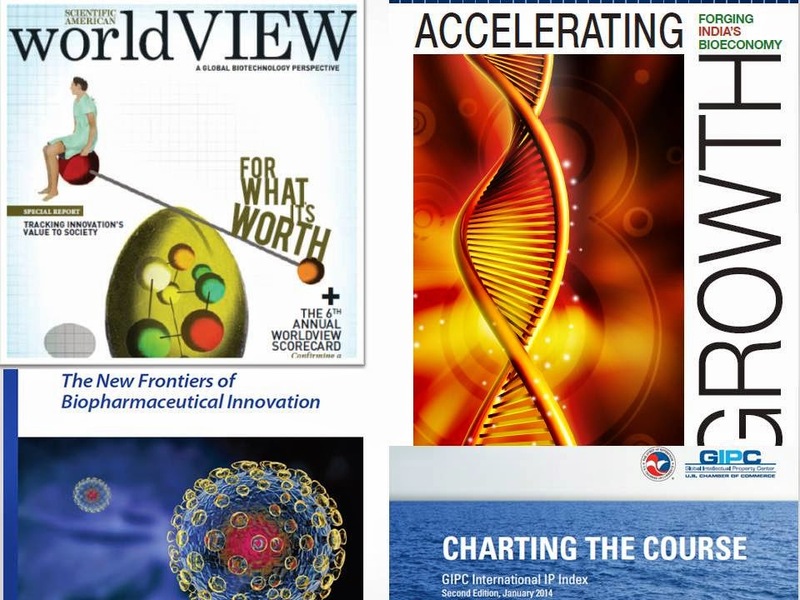 Moreover, China is set to outpace the US in investment in research and development. Since 2001, China’s R&D expenditure has been growing by 18% annually and has more than doubled as a share of GDP. In the US, that ratio has remained relatively constant. ...statistics from the US National Science Foundation reveal a genuine drive to innovate across much of Asia, with East, South and Southeast Asian countries together spending more on R&D than the US. And technology-intensive activity in the region is fast approaching that of North America and Western Europe. Indeed, despite territorial disputes and other divisive issues, the commissioners of the patent offices of Japan, South Korea, China and, to a lesser extent, Singapore and Taiwan meet often to define and coordinate their intellectual-property (IP) policies. China’s leaders know that they can learn from countries like Japan and South Korea, which implemented policies to encourage innovation and protect IP rights long before China did. This is good news. The territorial dispute and packing up of armaments seem to be exaggerated by some sectors and the mainstream media.Underneath are many avenues for peace and commerce -- more global and regional trade, in both goods and services, like IPR and innovative products and processes. More innovation will spur more global commerce and trade. And that should mean less likelihood of any regional war. 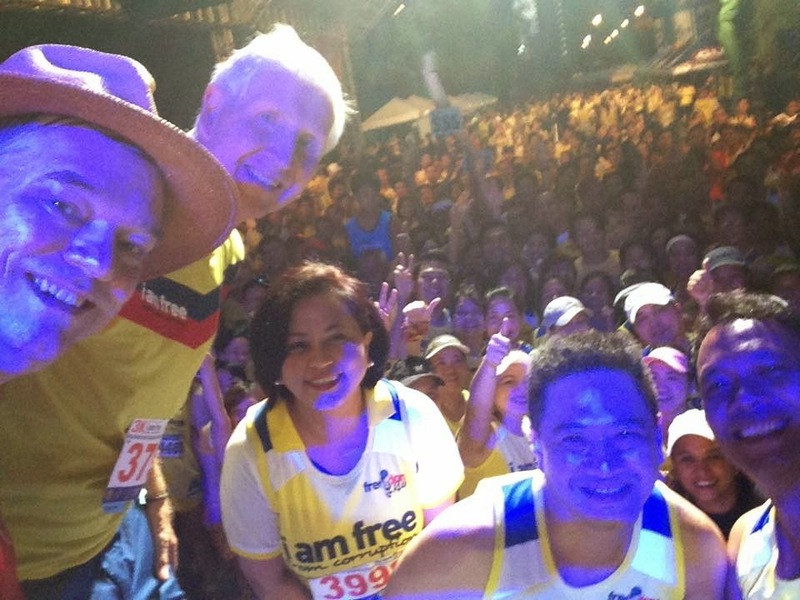 This morning, I attended the 4th Freedom Run sponsored by the Friedrich Naumann Foundation for Freedom (FNF) in partnership with other organizations, government offices and private enterprises. 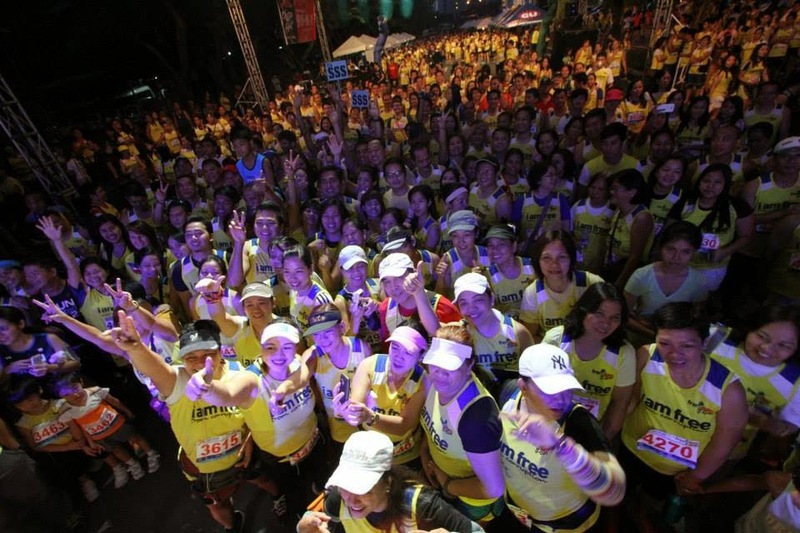 It was a big number of runners today, more than 3,200 people registered. The first five photos below from the FNF fb page and Jules' camera. From left: FNF Country Director Jules Maaten, European Chamber of Commerce Past President and convenor I think of Integrity Initiative, Henry Schumacher, Napocor President Gladys Cruz-Sta Rita, Cong. Erin Tanada, and LLDA Gen. Mgr. and former CALD President Neric Acosta. It was fun in the early morning, with early band performers, warm up exercises, etc. The marshall though told the 10K runners, me included, to go to the starting line early, and this is far from the stage. So we missed some of the speakers. Actor Dingdong Dantes was there, he arrived late I think. He joined the 3K runners. 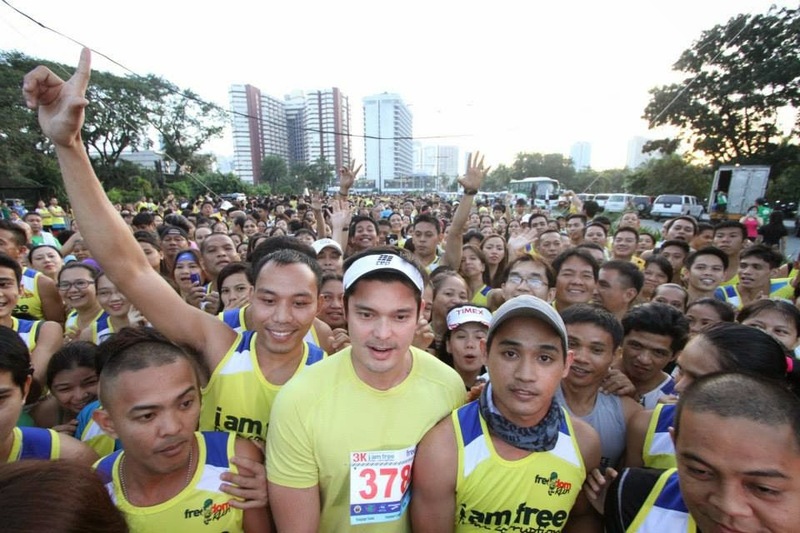 Last year, he also joined the Freedom Run, with gf Marianne Rivera. This one-legged runner, the other leg on prosthetics, impressed me. I took his photo on our way back to the start/finish. Then I briefly ran with him, he said he met an accident, his left leg was amputated. 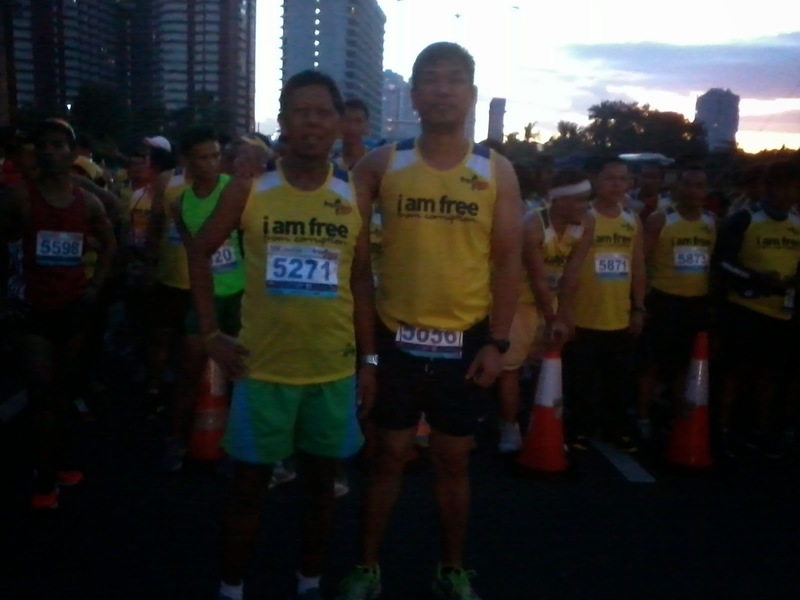 This is my 4th, straight participation in Freedom Run. 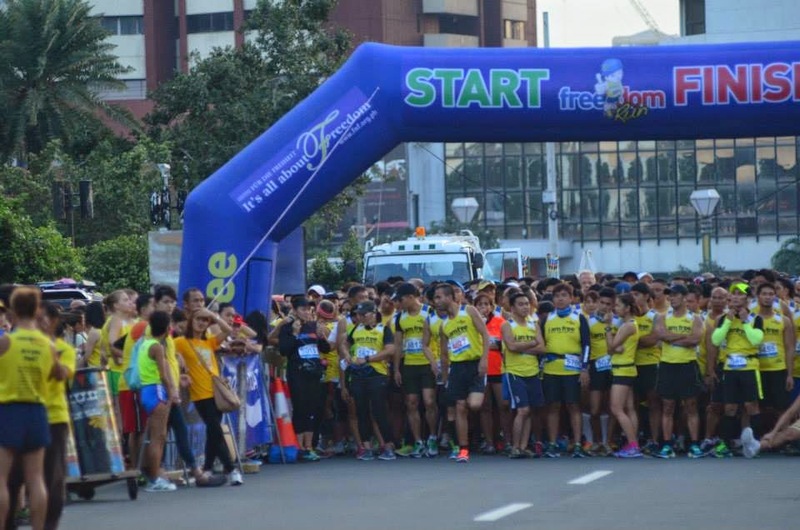 The 1st Freedom Run in 2011 held in UP Diliman campus. 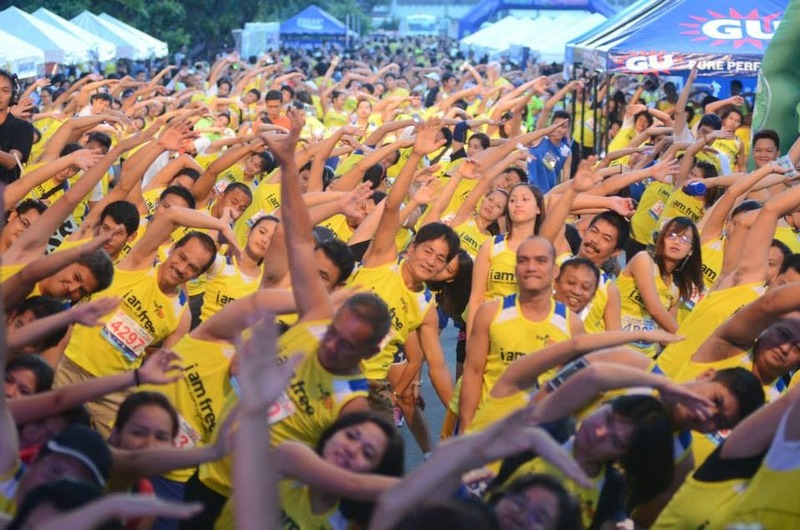 It was only a 3K and 6K run, many joined it. This photo taken by Jules Maaten. 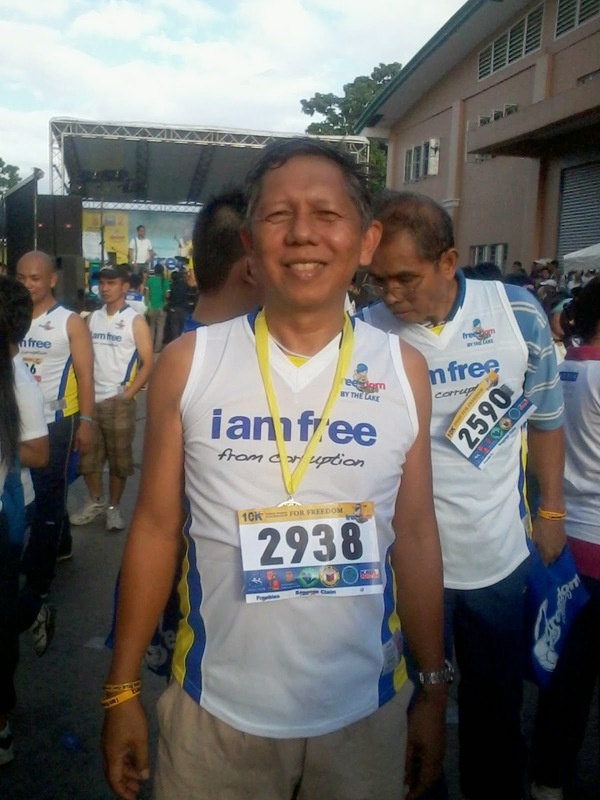 The 2nd Freedom Run in 2012 was held in Taytay, Rizal, going to a portion of Laguna Lake, and back. I ran the 10K. 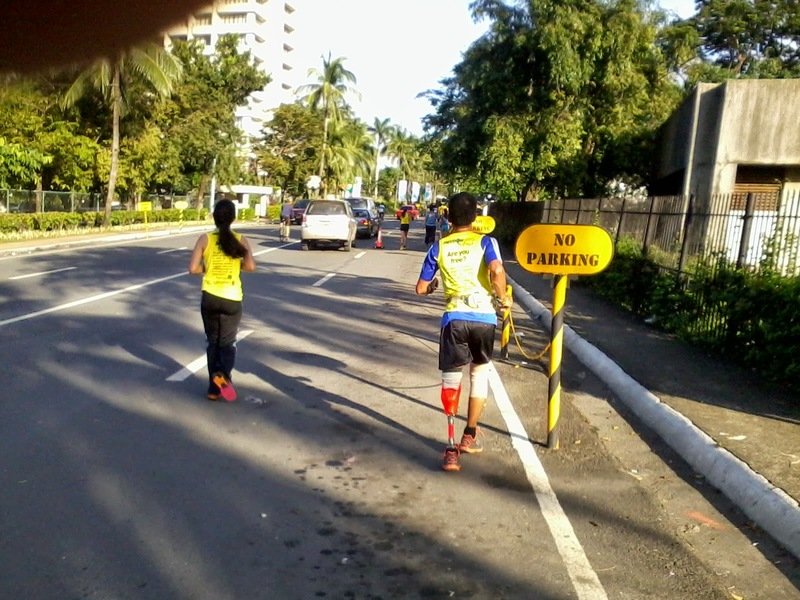 The 3rd Freedom Run in 2013 was held at the Quezon Circle, going to Commonwealth Ave. and back. Here with friends from FNF, from left: Julianne S. of the regional office in Bangkok, Thailand, Pimrapat also from Bangkok, Sungeun Lim from FNF Korea, and Wimonpug also from FNF Thailand. Today, I met a friend from Congress Mountaineers, Doming Gonzaga. He also ran the 10K. Another fun day. 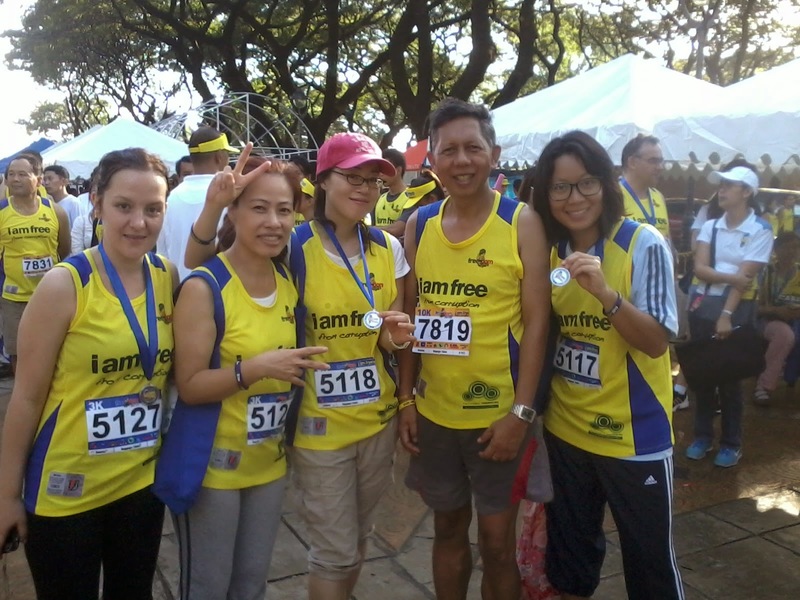 Thanks FNF for organizing such a famous running for freedom annual event. 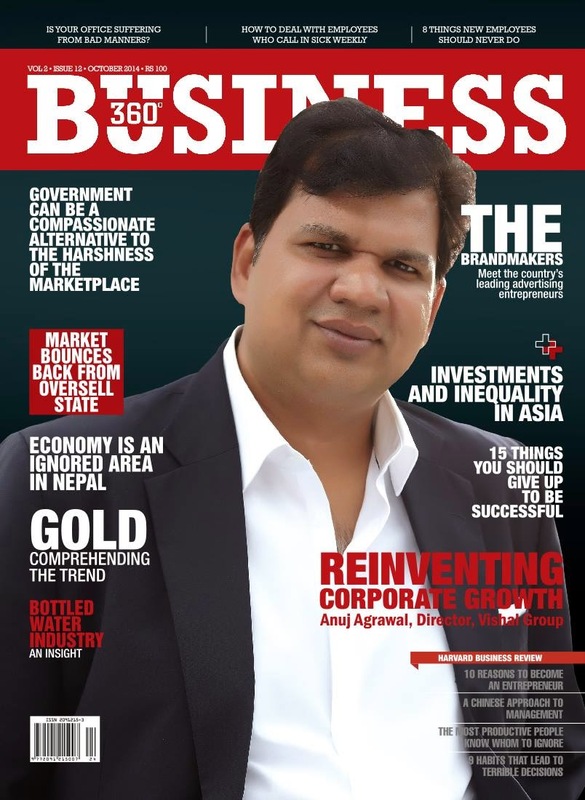 * This is my article for this business magazine in Kathmandu, Nepal, October 2014 issue. Accumulated savings become investments. And these in turn expand economic output and create new jobs, or expand the productivity of those who already have jobs. Such is the beauty of continued investments and savings accumulation. In many recent social literatures though, including those coming from the multilateral institutions and foreign aid bodies, there is growing disapproval if not outright contempt, of rising inequality within and among nations as they grow faster, as they attract more investments and expand economic production. Thus, the repeated call for “inclusive growth”, previously called as “growth with equity” or “broad-based growth”. To improve social equality within countries, some governments have erected various restrictions to foreign direct investments (FDIs). The Philippines for instance has that restriction in the 1986 Constitution itself, where in some sectors, foreign investments is totally prohibited while in some sectors, it is allowed up to 40 percent. Such restrictions make some foreign investors find other ways to come in and do business. Like having local dummies, so foreign money is able to penetrate even in sectors that is explicitly reserved for the local investors. But many foreign investors do not like that arrangement as it lacks transparency, and they cannot report to their shareholders and regulators in both home and host countries that they have invested in companies that are supposed to be 100 percent locally-owned. The next route for foreign investors is via the stock market. Not all of such market capitalization is foreign-owned of course, there are also many local investors in each country. Here are the figures for major Asian economies. North East Asia except N. Korea is generally developed. The economies there are able to attract plenty of domestic and foreign investments that create plenty of higher productivity jobs. South East Asia generally are emerging economies, except Singapore which is already a developed economy, and the three catching up economies of Laos, Cambodia and Myanmar. 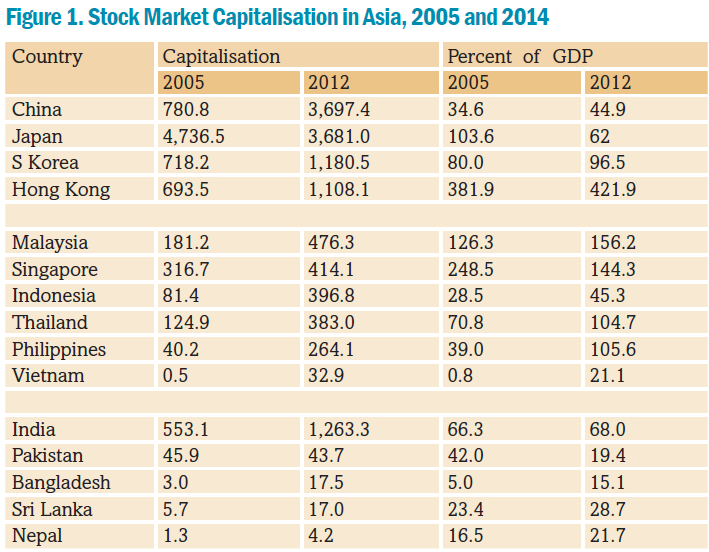 South Asia though remains not so friendly to the stock market system, except India. Nepal in particular is the least friendly or least attractive to investors in the stock market. In terms of FDIs in South Asia, the levels remain very low on average, except for Maldives. 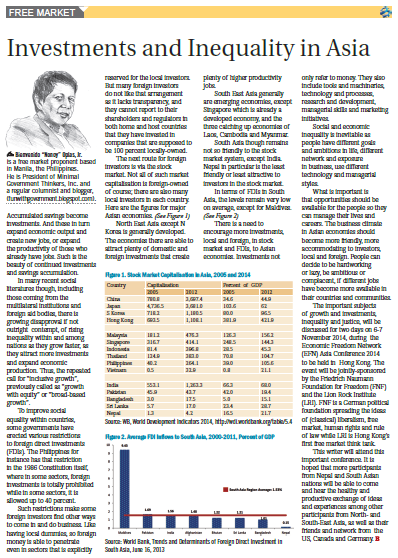 There is a need to encourage more investments, local and foreign, in stock market and FDIs, to Asian economies. Investments not only refer to money. They also include tools and machineries, technology and processes, research and development, managerial skills and marketing initiatives. Social and economic inequality is inevitable as people have different goals and ambitions in life, different network and exposure in business, use different technology and managerial styles. What is important is that opportunities should be available for the people so they can manage their lives and career. The business climate in Asian economies should become more friendly, more accommodating to investors, local and foreign. People can decide to be hardworking or lazy, be ambitious or complacent, if different jobs have become more available in their countries and communities. The important subjects of growth and investments, inequality and justice, will be discussed for two days this coming November 6-7, 2014, during the Economic Freedom Network (EFN) Asia Conference 2014 to be held in Hong Kong. The event will be jointly-sponsored by the Friedrich Naumann Foundation for Freedom (FNF) and the Lion Rock Institute (LRI). FNF is a German political foundation spreading the ideas of (classical) liberalism, free market, human rights and rule of law while LRI is Hong Kong’s first free market think tank. This writer will attend this important conference. It is hoped that more participants from Nepal and South Asian nations will be able to come and hear the healthy and productive exchange of ideas and experiences among other participants from North- and South-East Asia, as well as their friends and network from the US, Canada and Germany. 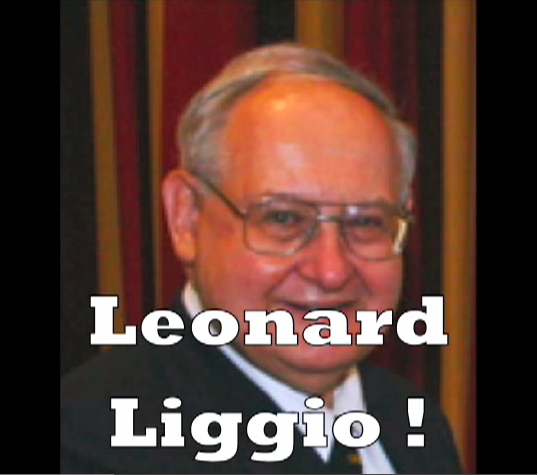 Rest in Peace, Prof. Leonard P. Liggio, Executive Vice President of Academics at Atlas Economic Research Foundation, Washington DC, USA. 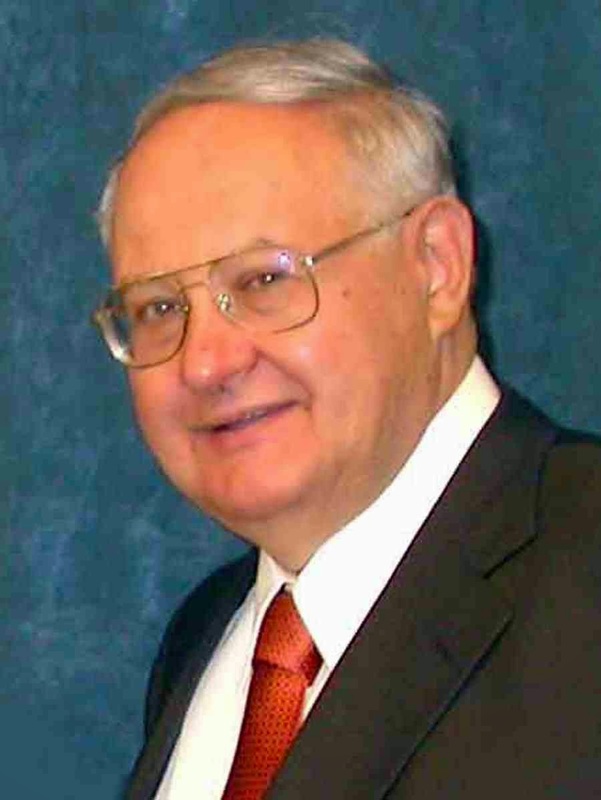 He passed away October 14, 2014, he was 81. 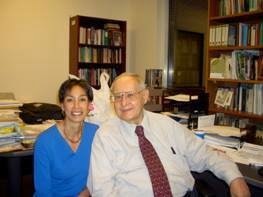 I met Leonard first time in April 2004 when Atlas granted me an international fellowship for one month to the US, along with Ellen Cain of the Foundation for Economic Freedom (FEF). First in Chicago for the Atlas Liberty Forum, then at the Atlas office in Fairfax, Virginia then. It was my first exposure to other free market-oriented groups, think tanks and individuals from many parts of the world. Leonard’s career advancing liberty spanned seven decades, during which time he served as the President of the Mont Pelerin Society, the Philadelphia Society, and the Institute for Humane Studies, where he later continued to serve as its Distinguished Senior Scholar. He was a professor at George Mason University, a visiting professor at the Universidad Francisco Marroquín, a board member of the Competitive Enterprise Institute, and a Trustee of Liberty Fund. 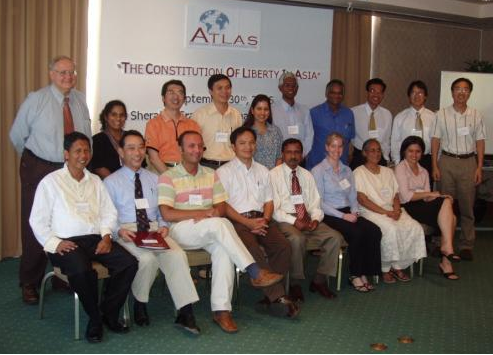 Then I met Leonard again in 2005 in Phuket, Thailand, when Atlas and the Friedrich Naumann Foundation for Freedom (FNF) sponsored a round-table discussion on "The Constitution of Liberty in Asia" where we discussed for one whole day Friedrich Hayek's book, "The Constitution of Liberty". He moderated the discussion, assisted by Colleen Dyble, then Director for Institute Relations of Atlas. I learned a lot from that forum. A few months before we went to Phuket, Atlas mailed to us participants a copy of Hayek's book. I remember that I had a hard time understanding Hayek's deep political philosophy then, but it was good that I re-read some of the chapters to appreciate the great Austrian economist-philosopher's thoughts. Our group photo below. Two names I cannot remember now, I put as (?). Standing from left: Leonard, (? from Malaysia), Hiroshi (Japan), Minh Nguyen (Vietnam), Charu Chadha (Nepal), Nambiar (Malaysia), (? from India), Kang Chandararot (Cambodia), Yongqin (China), Chung-ho Kim (S. Korea). Sitting from left: me, Mr. You (Japan), Paata Sheshelidze (Georgia), Cuoung Nguyen (Vietnam), Khalil Ahmad (Pakistan), Colleen Dyble (USA), Trupti Meetah (India), and Ellen Cain (Philippines). Liu Junning (China) was also there but he went outside when this photo was taken. Grateful to have the chance to visit Leonard Liggio today, my long time friend and mentor, to tell him how much he's meant to me all these years. Remembering our younger days. Today, she posted, Rest in peace, Leonard. Could there be a more gentle, knowledgeable, insightful, thoughtful person? A gentle giant, a gentle teacher. How blessed we are to have known him. I have met again Leonard in 2008 (Atlanta) and 2009 (LA, California) during the annual Atlas Liberty Forum. Jo Kwong looked for extra funding to allow me to travel to the US and attend those events, and met with other free market leaders from other parts of the world. Thanks once again, Jo. I will never your efforts then. 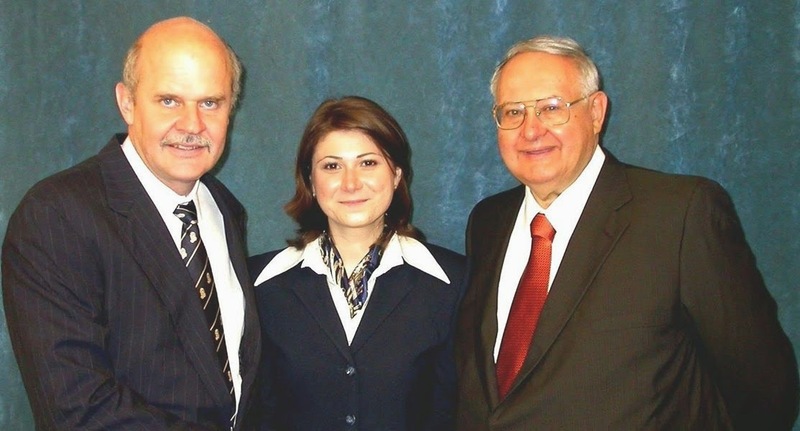 Ozlem Caglar-Yilmaz of the Association for Liberal Thinking (ALT) in Turkey posted this photo, with Alejandro "Alex" Chafuen, Atlas President, and Leonard. Leonard is known more by North and South American and European classical liberal academics and think tank leaders. He may have not traveled much to Asia, so the Atlas-FNF event in Phuket in 2005 was a great way for us Asians to know him more. Once again, rest in peace Leonard. It was great to meet you. An Indian friend, Barun Mitra, posted this interesting article from Live Mint, October 8, 2014. Perhaps the unanticipated outcome of these demonstrations is gradual transformation in the way China’s leadership wields power. China reviled and insulted Hong Kong’s last British governor, Chris Patten, who said that the only way to deal with China is by treating it like any other country. If it glares angrily, stare back. China respects strength in its rivals, not acquiescent kowtowing. Patten had limited time in China, but he succeeded in broadening the political space. 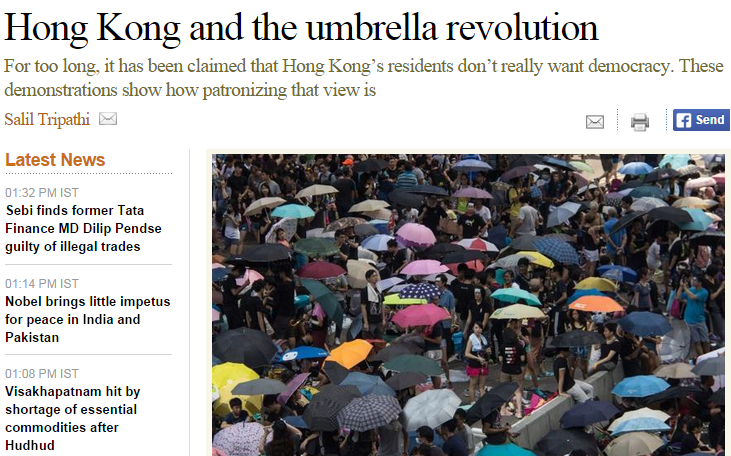 By staying firm on their demands, the demonstrators in Hong Kong are doing the same. The outcome isn’t assured. Hong Kong might become another Chinese city. Many think it already is. Or China might become a bit more like Hong Kong. We do live in interesting times." Why should Asians accept the Western religion of democracy? One place that has reduced wretchedness is not democratic India, but dictatorial China. And HK and Singapore are among the freest places in the world despite not being democratic. Democracy is not about majority rule, but about recognition of and respect for minority opinions. So that the minority view of today, may enjoy the freedom to peacefully persuade others, and could become a majority opinion of tomorrow.... For democracy to survive in large communities and countries, where only representative democracy is possible and practical, democracy has to be minimal, so that it does not offend or alienate too many people. Secondly, as societies become complex, there is a need to recognise the challenges of centralised government, and devolve greater political authority and autonomy to lower tiers of government and local communities. Because only at such community level, with shared values, can there be a realistic prospect for widest consensus on such complex issues. Right. As economies become more prosperous, people become more impatient with dictatorship and authoritarianism. Democracy is not be-all and end-all for them, but the freedom of expression available under democracy is a lot more preferable than the unfreedom and self-censorship of undemocratic but rich economies like HK and Singapore. The Singapore government is more flexible and more sophisticated in its political dictatorship than that in HK or China. But there are several signs of discontent looking for more sophisticated outlets there. I emphasized"self-censorship" above and not "HK (government) censorship". For instance, can ordinary HK people rally in the streets and shout or have huge placards saying "Down with China Communist Party", the same way that Filipino activists can rally in the streets and shout "Down with President Aquino (and all previous administrations) and the Liberal Party"? If the answer is No, then there is self-censorship. The HK demonstrators, including friends at the Lion Rock Institute (LRI) reject the status quo, that all major political issues must get approval from Beijing. There has been a slow but steady reduction of free market culture in HK under the status quo. Friends at LRI and Momentum 107 have protested the huge tax hike of real properties in HK that has been implemented several years ago. They did not support the creation of a new bureaucracy, the Fair Trade Commission, which I think has been created already. They did not support the enactment of minimum wage law in HK. HK under the status quo is following Beijing footsteps. The protesters want a break from Beijing, to get out of China Communist Party delegated dictatorship as much as possible. The status quo is leading towards bigger government in HK. The Democracy movement, though not a monolithic ideological movement, has elements unsupportive of more, bigger HK government. The rise of China which threatens democracy is nonsense. However, "one reason why so many democratic experiments have failed recently is that they put too much emphasis on elections and too little on the other essential features of democracy. The power of the state needs to be checked, for instance, and individual rights such as freedom of speech and freedom to organise must be guaranteed. The most successful new democracies have all worked in large part because they avoided the temptation of majoritarianism—the notion that winning an election entitles the majority to do whatever it pleases." Hong Kong (and many other countries or economies) needs more democracy than ever. Democracy is good, not bad or unhealthy, for Asia. Freedom of expression without the use and advocacy for violence and aggression is more needed now. When governments use more force and coercion, explicit or implicit, by police or court harassment to limit freedom of expression, that means governments are getting bigger and becoming more allergic to protecting individual rights and liberty. Free trade is part of human nature. People may oppose it philosophically but consciously or unconsciously, they are engaged in it. Even militant protectionism crusaders are still humans, they need to eat, and they want free choice where to eat. Do not go to restaurants that are too expensive for their budget, never go back to a resto which may be cheap but the service is too annoying. They want to be served well given their budget, or they may endure bad service in exchange for really cheap food. That is the beauty of voluntary exchange, no one is forced and coerced to give his/her money to people who do not provide their specific needs. That is the beauty of free trade. Thus, even the most authoritarian governments recognize the value of free trade. But because they are authoritarians, or semi-authoritarian protectionists, they want to limit and restrict trade because they are protecting certain sectors, like the business interests of their friends, families and campaign financiers, or a considerable block of voters.Thus, multilateral trade negotiations towards free trade has become too bureaucratic and time consuming. Some countries and economies have taken the unilateral trade liberalization route -- Hong Kong, Singapore, Dubai, Chile, among others. And have good results. 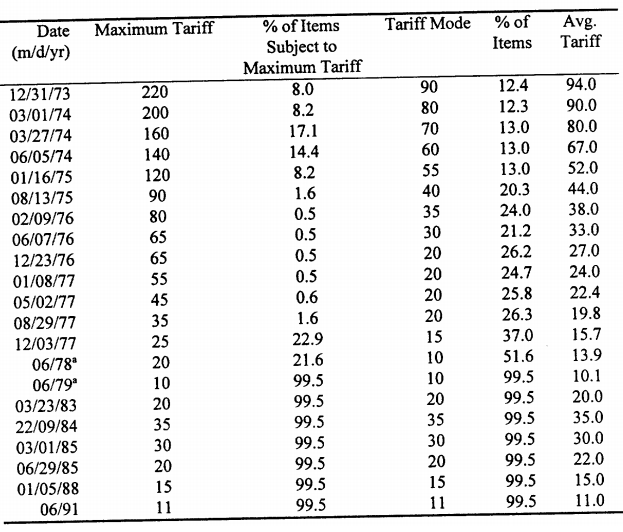 Chart below shows that as of 2001, average tariff in S. America was around 12 percent vs around 4 percent in East Asia, zero already in Singapore. East Asians are more receptive to unilateral trade liberalization than their counterparts in S. America or Africa. Applied Most Favoured Nation (MFN) Tariff Liberalization in Latin America and East Asia. When it comes to agricultural products though, economies in general are more protectionist even if they may be relatively free traders in non-agri products. Stark cases are Korea, Turkey, Egypt and Thailand. The exceptions to this agricultural protectionism are the unilateral Asian free traders HK and Singapore, and some countries in S. America, Argentina and Brazil. Data also from R. Baldwin. In this working paper at the WB, Nogues argued that "Developing countries would gain far more from unilateral than multilateral trade liberalization negotiations over many years." But since the 1950s...trade theory has pretty-much consistently shown a hierarchy of mechanisms for increasing commerce across borders: unilateral trade liberalization is best, followed by multilateral trade liberalization (although the current WTO round of trade negotiations is dead), and then regional or bilateral agreements. Two groups of people dislike unilateral trade liberalization. The first is the group of some local business (like cronies) and political interests (trade unions, big farmer organizations). The second is the group of government trade negotiators and consultants (including academics), they do not want to lose their perks of frequent global junkets flying to many countries and flashing or exotic cities doing all sorts of trade bargaining that last for many decades. Consultants get huge amount of money justifying restrictions to trade, explicit or implicit; economic or social or environmental. Ordinary consumers and independent researchers, them who are not corrupted by government and foreign aid money and consulting, should push the logic of unilateral trade liberalization. Ordinary consumers benefit from more choices, more options, where to buy and whom to sell.